I shot this picture in my local Tesco’s supermarket recently. 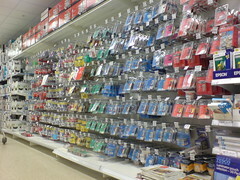 This is the printer cartridge aisle. I know printer ink is more expensive than vintage champagne (or human blood for that matter). But this enormous mountain of ink is only a tiny representative sample of the totality of form factors for ink delivery out there. Each time Dell or IBM or HP produce a new printer they seem bound by some crazed anti-reuse cancer to produce a completely brand new delivery system. The obsession with eluding the cartridge refillers (who are doing the planet and our pockets a great service) must stop and some kind of move to a standardised delivery system has to be the future for this industry. Can you say carbon footprint?